After showing them off at Gamescom and IFA this year, Samsung has finally announced the global launch of its curved gaming monitors that boast quantum dot technology. How exactly is quantum dot technology good for gamers? Quantum dots are essentially tiny nanocrystals which, when charged, are able to display 125% of the sRGB color spectrum and therefore allow for greater color accuracy as well as a higher contrast ratio of 3000:1 which should result in more visually dynamic gameplay. The display will also integrate AMD's FreeSync technology rather than use HDMI functionality in order to synchronize the screen’s 144 Hz refresh rate with users’ AMD graphics cards. As a result of this, users should see fewer instances of image tearing, stuttering, and flickering in their gameplay. 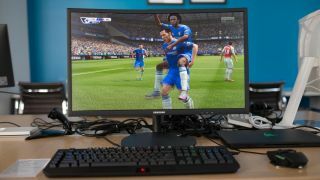 Specifications like these are appealing, but to make it especially clear that they’re reaching out to gamers Samsung has equipped the CFG70 a “dedicated gaming interface” that will allow for easier modification and personalisation of gameplay settings. Samsung is dubbing the 1800R curved screen a “Super Arena” design which “is formatted to match the natural curve of the human eye.” Basically, it seems that the curve is intended to gently hug your eyes and shield your peripheral from any real-world movement that has the nerve to attempt to distract you. On the announcement, Samsung stated that the planned price points for the 24- and 27-inch versions of the monitor were $399 (about £300, AU$530) and $499 (about £380, AU$660), respectively. Quantum dots can't burn in, so what is Samsung's new warranty all about?